Skill Builder: ﻿Is it Safe, Legal and Ethical? 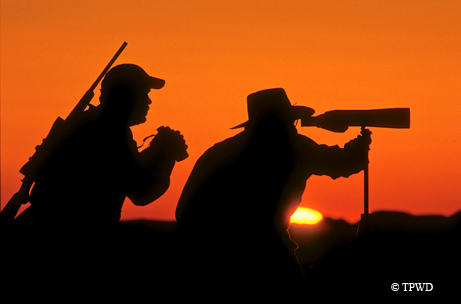 ﻿Hunters should ask three questions before they shoot. ﻿﻿Shoot or don’t shoot? Skilled hunters can quickly assess whether any shot is safe, legal and ethical, but it takes knowledge and experience to determine the answer. Try your hand at these scenarios, and be ready to make those important split-second decisions in the field. Scenario One: In the distance, you see a deer standing. Using binoculars, have you made sure to observe carefully what is in front of and beyond the deer before you make the decision to pull the trigger? Is the field of view clear of hunters, obstructions, buildings and roadways, as well as other deer or animals? If so, then the shot is safe. Now that you have determined that the shot is safe, is it legal? Check the antlers. Texas has a 13-inch antler restriction in at least 113 counties. Make sure the inside of the antler spread is outside the ears, and that you can see at least a couple of finger-widths of daylight between the outside edge of the ears and inside edge of the antlers. See the Texas Parks and Wildlife Department’s Outdoor Annual for clarification (www.tpwd.state.tx.us/publications/annual). Scenario Two: You are dove hunting and see several doves sitting in a tree. Should you shoot? Let’s assume it is a safe shot. It is legal, but not often ethical. Normally we shoot a dove in flight, giving it a chance to get away. A new hunter who has hunted hard all day without much luck can make the decision about whether to shoot or not. Either decision — to shoot or not to shoot — is acceptable, but not shooting is preferred. Students in Texas’ hunter education course walk down a mock hunting trail to test themselves with shoot-or-don’t-shoot scenarios. Hunter education is mandatory in Texas (as it is in every other state, in one form or another) and is a vitally important process. Instructors often use the hunter skills trail as hands-on hunter education training for both adults and young people. The hunter skills trail is a sequence of scenarios set up to simulate a real hunting experience. Individuals or small groups are led through the trail and asked to react to these scenarios. The instructor evaluates students’ reactions, either immediately or at the trail’s end, and encourages small group discussion. Students must rely on their knowledge and skills to answer three questions: 1) Is the situation/shot safe? 2) Is the situation/shot legal? 3) Is the situation/shot responsible or ethical? Participants must respond to the scenario by shooting or declining to shoot. The hunter skills trail may be the first “hunting trip” for beginning hunters. It gives novices a chance to evaluate a variety of hunting situations, as well as practice muzzle control, loading and unloading firearms, field carries and other basic skills. These exercises let students practice what they have learned in the classroom. The hunter skills trail teaches students to think about the real consequences of their own actions and the actions of others. Are you an experienced hunter interested in sharing what you have learned over the years? Become a hunter education instructor. For details, call (512) 389-4999 or go to www.tpwd.state.tx.us/learning.